In Cape May, New Jersey, sits a mansion shrouded in earth tones and the privilege of a warm history. George Allen, a Philadelphia merchant, commissioned a country estate for his family and future descendents in 1863. He chose the location because it was South of the Mason-Dickson line and allowed him to do business with both Confederate and Rebel soldiers during the Civil War. Internationally acclaimed architect Samuel Sloan designed the seaside palace and Henri Phillipi built it. 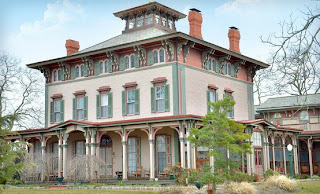 In 1879, the beloved summer home escaped a great fire that swept over Cape May. However, after eighty-three years, it couldn’t escape the neglect an owner could inflict upon it. Evidence to support sightings of a reptilian creature in South Carolina is sought. Also: Footage of alleged paranormal activity captured at a gas station in Ohio is scrutinized. Tune in tonight at 9/8c to see the surprising results. The most shocking and surprising episodes are coming this fall as Ghost Hunters returns in September! Are you looking forward to Destination Truth's return to Hoia Baciu Forest? What do you think they'll find during their second trip? The following event took place shortly after my wife and I were married. Due to the economic situation at the time, I could not land a job, and so we had a temporary bedroom set up in my father-in-law’s basement. It was late, sometime after midnight, and we heard one of the cats tearing around upstairs, as cats are wont to do in the quiet hours of the night. There was nothing out of the ordinary in this; we were quite used to it. Then we noticed two things. First, there was a cat lying in the bed with us. Again, nothing out of the ordinary there; he often slept with us. Second, we saw a pair of green eyes staring at us from across the basement—our other cat, who we recognized by her black and white fur. At this point, my wife and I exchanged wide-eyed glances. We only had two cats. The Brady Theater is located in Tulsa, Oklahoma. Even though it was named after "Tate Brady", an affluent oil baron, the real owner was Mr. Peter Mayo. Mayo renamed the theater to reflect the district which was also named after "Tate Brady." 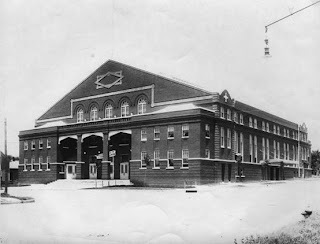 The Brady Theater was the largest theater west of the Mississippi River. It hosted some of the most famous actors of its time including the one that is said to haunt it til this day, the famous Italian tenor, Enrico Caruso. The team prepares for a strange encounter of a third kind. Tune in Tonight at 9/8c to see what happens. For Grant’s final investigation, the hunt leads to the team to Jason and Grant’s very own haunted property. Tune in Wednesday 9/8c! Which new paranormal reality show are you looking forward to seeing? Why? The team travels to Texas for a ghost hunt and to Kentucky in search of Sasquatch. Watch what they find TONIGHT at 9/8c. Grant's final episodes continue to countdown. The last one will air on May 16th. This Wednesday, TAPS returns to the Mt. Washington resort in search of a paranormal princess who refuses to check out. Tune in at 9/8c! Today, Richard Wiseman's book Paranormality: Why We See What Isn't There is available for FREE on Kindle devices. Who is Richard Wiseman and do you agree with his position on paranormal phenomena?